For weeks on end, she chose to hold her tongue, and at one point, an instructor finally asked her why. With absolutely no malice, she gently replied that perhaps her classmates chose their words too carelessly. That maybe some talked too much, without forethought, with little regard of meaning, of impact. Well. Finally, it was Binti’s turn to speak,pressed into making a presentation for her Criminal Justice class at Kent Career Tech Center. Each student was assigned the task of explaining which branch of the military they found most appealing. Binti chose the civil affairs unit, charged largely with working in conjunction with the United Nations toward global peacekeeping efforts. And then she went on to stun her classmates with a story none of them – nor her instructors – saw coming. The award, given to dignify her accomplishments in a nontraditional career and technical education program, is presented to no more than two high school students yearly, one male and one female. Indeed. If the rest of the world would stop long enough to absorb Binti’s chilling story of trauma, survival and recovery, veritable millions of us might stop sweating the small stuff, and focus instead on people and things that truly matter. Consider, for instance, that although Binti presently lives on a quiet, tree-lined street on the North End of Grand Rapids, her early life was marked by fear of everything from being hacked to death by a machete to being eaten by wild animals. She grew up in Kenya, one of eight children born to father Abdikadir and mother Adey. And from the time she was born in 2000 until the family finally escaped their homeland in 2008, it was a life of hardship and too many episodes of terror. Their horrific odyssey was tied to long-standing conflicts between Kenya and its neighboring country, Somalia. Over the last century, their relationship has been affected by everything from petty skirmishes to full-blown massacres, resulting in the displacement of thousands. Staying alive even during peaceful times was a chore. The nearest water source was more than eight miles away from the tiny village of Masai, which housed Binti’s family and fewer than 200 members of the Wazigua people. She owned exactly three changes of clothes. And for shoes, they would fashion crude covering from soda bottles, lashed with twigs. Which begs the question, How do you feel surrounded by peers who complain about their personal effects, who crave a better mobile phone, whine about needing more cash? This is the story she shared with her teachers and classmates, in what was supposed to be a presentation of a few minutes’ time, but extended far into the class period. Instructor Gregg Isenhoff remembers the moment with extreme clarity: “She starts talking about the genocide of her people. And literally, I stop her presentation, and every student is looking at her. Isenhoff was so impressed – and spellbound himself — he asked Binti to recast her story and tell it to all 147 students enrolled in Criminal Justice there. Subsequent to that, Isenhoff helped Binti write an application for the state of Michigan award, and it ran to some two dozen pages. Isenhoff emphasizes that the ripple effect of Binti’s story is something for both students and teachers to savor. Even after telling her story, Binti continues to lead by example, often times without even realizing it. Earlier this year, for another assignment, Binti was scheduled to give remarks for a “SkillsUSA” competition, being held in downtown Grand Rapids at the Amway Grand Plaza Hotel. The organization is a partnership of students, teachers and industry focused on maintaining a skilled workforce. As things were winding down, Binti was spotted walking away from the hotel with a briefcase in hand. Someone wondered if her ride was nearby. “Oh, no,” she replied, “I walked here” — a distance of some two miles. “That alone,” says Isenhoff, “demonstrates that Binti has what it takes to achieve whatever she wants to achieve in life. When some of the other students heard this story, they realized some of their own inadequacies, that they’re not pushing themselves enough to succeed in their own lives. 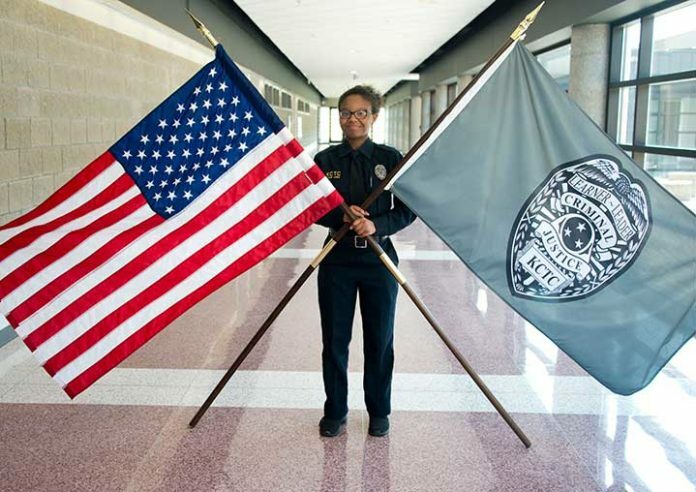 Binti – who attends Union during most the school day but attends the Tech Center from 6:45 a.m. until 9:10 a.m. – exults in the Criminal Justice program, especially since she has a deep respect for American officers. That counters her opinion of law enforcement officers she and her family encountered in Africa, who can be corrupt, depending on varying circumstances from country to country. She has her sights set a bit higher, though, given her experience spent in a refugee camp in Somalia, which was a precursor to arriving in the States.